My good 'ol iPhone decided to die on me & I was left with no access to "civilisation". Umm, not literally. But you know the withdrawal symptoms that surrounds you when you're away with your smartphone for far too long. Yeah, you get the idea. I do have a spare phone, a Nokia 6100 that uses a standard size SIM card which my micro SIM stands no chance in fitting snugly into the compartment. 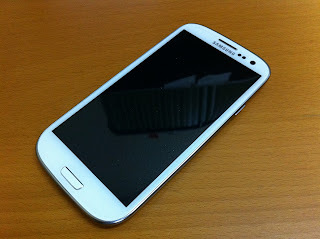 Whilst my phone was sent to the shop for repair, my cousin bro's gf was kind enough to lend me her brand new Samsung Galaxy SIII for a week. Yes, you read it right! A week~ I was cautious enough from leaving any smudge on the gorgeous large screen because the phone was barely...2 weeks old? How did it felt being an Android user for a week? It's a breath of fresh air, if you ask me. A huge change from the rather rigid iOS that it does get a little dull after 2 years of usage. Not if you had your iPhone jailbreaked. Anyways, the functionality & flexibility on the Android or specifically the Galaxy SIII is vast that it does take quite a bit of time getting used to. The screen is pretty sensitive & half the time my fingers accidentally brushed on the soft keys, unwillingly activating some menu or functions. It does get pretty annoying after several days. The huge 4.8" screen is gorgeous & my iPhone looks inferior next to it. The Koreans have outdid themselves by designing a phone with beautiful lines incorporating a large screen without compromising the thickness. I was really tempted to get the SIII myself but didn't because that would cost me RM2,199 at retail. Besides, the repair fees for my iPhone was only RM300 so I chose to be more prudent instead. When it was time to return the SIII to its rightful owner, I couldn't bear to part with this baby. Can you imagine that? It did grew on me pretty quickly. Since I won't be able to hold it anymore, I took a picture of it & sharing it here. SIII, you have served me well. One day when my humble iPhone reaches its final journey, you'll know what phone I'll be looking for.